Well, friends, I have been sick for over a week now. And I tell you what – I am sick and tired of being sick and tired! I’ve alternated between making comfort foods (like this tomato soup), snacking on whatever sounded good when I had no appetite, and ordering takeout on the days that cooking seemed an insurmountable task. Finally, I hauled myself to the grocery store on Sunday (my most sincere apologies to anyone who had to witness my sneezing, snotty, slightly-green-faced self), and loaded my cart up with all kinds of stuff to make a veggie-packed, comforting minestrone soup. I am not always much of a soup person, but a big bowl of soup filled with vegetables and pasta and lots of parmesan sounded like just the thing I needed. Added bonus: it was pretty darn quick to make! So, about the time I felt the need to retire to my fainting couch for a rest, everything was in the pot and ready for a simmer. Excellent. 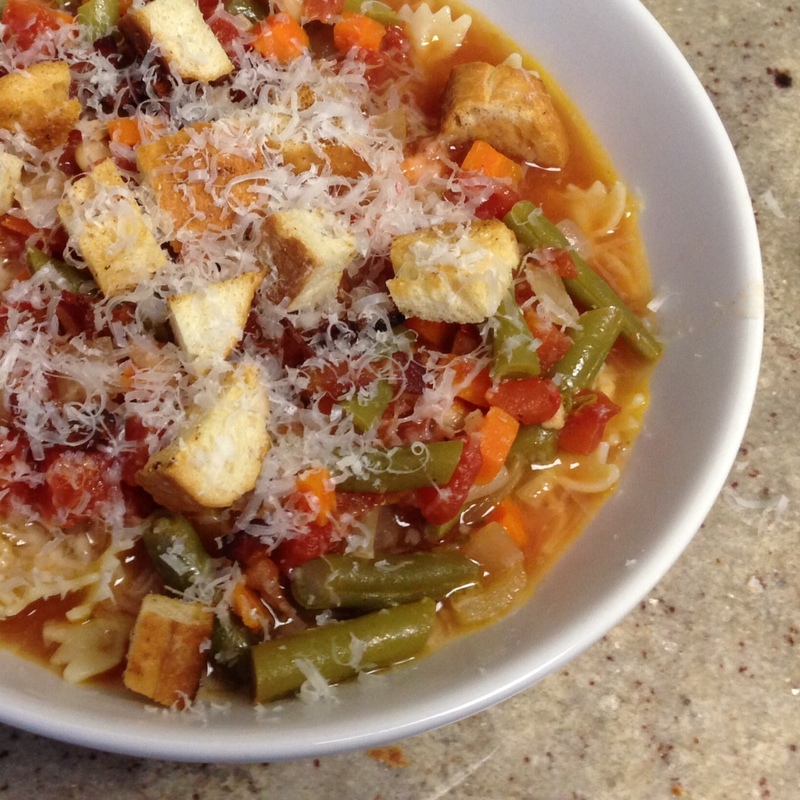 *Even if you are not in the habit of buying fresh chunks of parmesan, this soup would be a good reason to start. The rind of the parmesan adds a lot of flavor to the soup as it simmers, and it would be tough to pull comparable flavor from simply adding parmesan to the soup. As I go through parmesan, I just throw the rinds into a plastic ziploc bag, and keep them in the freezer for use later. If you don’t already have a rind waiting for you, just cut it off the fresh chunk of cheese you bring home from the store, and use it right away! 1.) Add the bacon pieces to a large, heavy-bottomed pot, and turn the heat to medium. Allow the bacon to cook until crisp, and then remove to a paper towel-lined plate with a slotted spoon. Drain off all but one tablespoon of the bacon grease. 2.) Add the carrots and onion to the pot, stirring to coat with the bacon grease. Season with a pinch of salt, and cook until softened, about 4-5 minutes. Add the garlic, and cook until fragrant, about one minute more. 3.) Pour the tomatoes and chicken stock into the pot, and bring the soup to a boil; immediately reduce to a simmer. Add the cannellini beans, green beans, parmesan rind, oregano, and pepper to the pot, and allow everything to simmer for about 15 minutes, until the green beans are bright green, and crisp-tender. 4.) While the soup simmers, make your croutons. Preheat your oven to 350°, and line a small baking sheet with foil. Pour the olive oil over the bread cubes, and toss until all the cubes are well coated. Sprinkle the croutons with the kosher salt and garlic powder, and bake until golden brown, about 10 minutes. 5.) 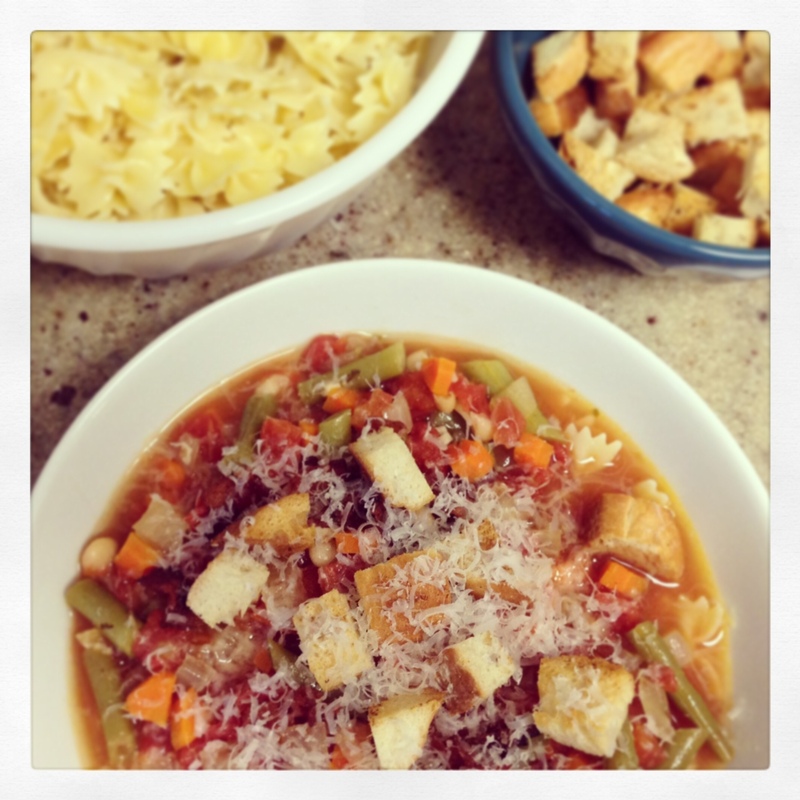 When the soup is ready, spoon some pasta into the bottom of the bowls, and then ladle the soup over it. Top with some of the reserved bacon, croutons, and a sprinkle of freshly grated parmesan. This soup covers a lot of bases: salty (parmesan and bacon), crispy (croutons), creamy (pasta and beans), and healthy (lots of veggies)! The crisp green beans lent a nice freshness to the soup, as well. One small side note: if you are planning to serve ALL of the soup immediately, you could add the pasta (already cooked) right into the soup a few minutes before serving, so it just warms through. However, if you’re planning on having leftovers, I find it’s best to keep the pasta separate from the soup, and just add it right before serving; that way, the pasta doesn’t get soggy and mushy from soaking in the soup. This looks absolutely perfect! Can’t wait to make! Laura – I’m sorry, but there is no print button! We’ve not yet gotten that advanced 🙂 Hopefully soon!